Bing Liu began filming his friends in his early teens, as any skater with access to a camera would do. He captured everything, all of their tricks, stunts, and adventures simply with the aim of cutting together montages for skate videos. More than a decade later, Liu continued documenting a few of his close friends, even though they weren’t skating as often due to the constraints of impending adulthood. The evolution of this tight-knit group, of their individual lives, and of Liu as a filmmaker come together with increasing depth in the powerful feature documentary Minding the Gap, streaming on Hulu. While filming many fellow skaters over the years, Liu saw patterns of personal pain that went beyond the physical bruises from wiping out on the board. In Minding the Gap, though, he focuses on just three characters, the guys he’s known -- or sought to know -- the best: Zack, a young father-to-be when he’s introduced in the film; Keire, a younger boy dealing with the death of his father; and Liu himself, battling his own demons from behind the camera. There’s also Nina, the mother of Zack’s child, who remains an important supporting character throughout the doc. 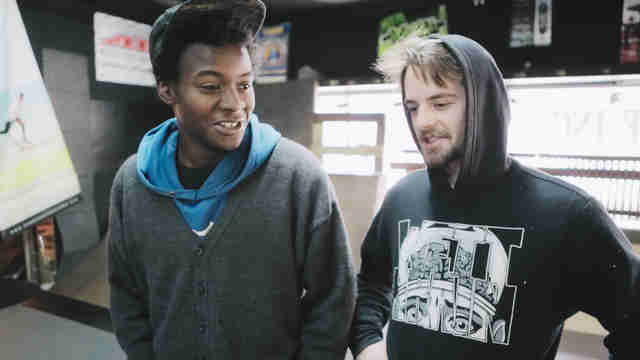 Minding the Gap initially recalls historical skateboarding films like Dogtown and Z-Boys and This Ain’t California, as well as more experiential docs such as Dragonslayer and Only the Young. And for a while, Minding the Gap appears to be just another film about young people with uncertain futures, coming of age in poor communities, and struggling to further the cycle of the working-class existence. Liu follows Zack and Nina in their lives as parents and their paycheck-to-paycheck jobs as a roofer and bar waitress, respectively. He chronicles Keire in his first employment, as a dishwasher, while living at home with his mom. He engages with Zack directly, captures Nina’s testimonials about him, interviews Keire’s mother. These are detailed personal portraits of his subjects and friends. Slowly, Bing Liu as a character starts to seep into the picture. The first time we realize Minding the Gap is also an autobiographical film is when Liu casually interviews a local skate shop owner and the conversation is mostly about what an introverted kid the unseen interviewer was. "I distinctly remember asking if you were gay," the man behind the counter says. "I knew you had some huge weight on you." More is revealed about Liu when he interviews his half-brother and they take a tour of the childhood home the budding filmmaker has long since moved out of. Unlike most first-person documentaries, this one doesn’t feature voiceover narration from its director. Because Liu as a character manifests so subtly, he’s the most intriguing. We assume that, in contrast with Zack and Keire, Liu has escaped life in the financially depressed city of Rockford, Illinois, for maybe college and pursuit of a career. But we don’t hear of, let alone see, him going off and earning a degree or serving, as he has, on the crews of Hollywood movies and series such as Jupiter Ascending and Shameless. It’s exciting in a way, then, to eventually see Liu on camera while he interviews his mother. At this point, he’s revealed to have advanced beyond the one-man, DIY style that had derived from his skate video days. Obviously, he has a crew now, as someone else is pointing a camera at him. And he is surrounded by an extensive lighting set up. His mother is positioned for a formal sit-down. They’re separated not just by the camera between them but also in the meaningful edited cross-cutting from mother to son. There’s a knowingness to Minding the Gap as both a progression and a mixing of filmmaking techniques. Zack will look to Liu through the lens and ask if they are doing the kind of scene where he ignores his friend/director or the sort where he acknowledges the film and his being filmed. And there are narrative arcs that unfold completely in front of the camera and others that extend to the meta-level of its process -- not just in terms of the production of a documentary, but also in Liu's close involvement with his subjects and their story together. Well into the documentary, Liu is given some information that he’s unsure how to address and resolve, as a director and as a friend. His voice heard off camera, he attempts to work out the dilemma with the person in the shot. He brings it up with other subjects as time goes by, the elapsing of years in the story always discerned easily in the growth of Zack and Nina’s little boy. Minding the Gap does more than ripen from happy-go-lucky skate film to drama-filled documentary. It’s also a heavy examination of abuse as a consistent theme and, because this is all very real, as a serious issue. Covering so many years, Minding the Gap has a rich and epic sense to it while remaining primarily an intimate, immersive, and whelming tale of a friends finding their way within and without the tragic pains of their past and everyday struggles of the present. The film is impressive in many ways, but Liu's balancing act of subjective and objective perspectives is astonishing -- while managing solo duties as director and cinematographer, he had help piecing it all together from experienced editor Joshua Altman (The Final Year) and surely the benefit of being steered by producers at Kartemquin Films, including Hoop Dreams director Steve James. This is a once-in-a-lifetime accomplishment for Liu, the intimacy with his material and the breadth of its scope presenting a rare opportunity. Still, his continued path as a director will be exciting to follow in this film's wake. His debut feature is likewise an incredible experience in encountering a new artist's voice and subject in a uniquely modest fashion. Part memoir, part social problem film, Minding the Gap is a treasure of a documentary. Christopher Campbell is a freelance film editor and critic, and the founder of the documentary review site Nonfics. Follow him for opinions of all sorts of movies @thefilmcynic.